Hot on the heels of the sell-out sale of the ‘Captain America collection’ in March, Historics forthcoming auction on 18th May will offer an eminently attractive Alvis Speed 20 complete with its own sparkling CV. Previously owned by Hollywood siren Claire Luce - whose glittering screen and stage career saw her appear alongside luminaries like Fred Astaire and Humphrey Bogart - this 1934 Alvis Speed 20 SB Open Tourer also shared the spotlight with Luce in the 1935 British film, ‘Lazybones’. Registration AYX 94 was offered originally by London based dealer Charles Follett – who specialised in the more desirable two-door tourers, sports saloons and drophead coupés by Vanden Plas – and following ownership by Claire Luce, was subsequently purchased by the renowned rally driver and one-time winner of the Monte Carlo Rally (1953), Maurice Gatsonides. Gatsonides perhaps has greater notoriety as the creator of the Gatso speed camera and despite his ownership of this pre-war ‘bullet’, the description of this most desirable model is not intended as a trap. 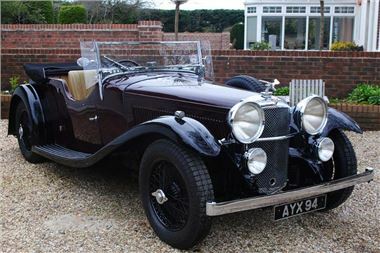 Introduced in 1932, the Speed 20 was the first post-vintage design from Alvis, with the second series of the car adopting the SB moniker, and its bristling performance – the top speed of 90mph now aided by a new all-synchromesh gearbox – was allied to a more sporting look to that of its predecessor, the SA, thanks in part to a longer, lower chassis and the addition of imposing Lucas P100 lamps, fitted as standard. Its Vanden Plas-style touring coachwork – in this instance converted from drophead coupé – is considered the most desirable configuration, and having undergone a sympathetic, no-expense-spared restoration in 1999, has been superbly cared for since. With the price of subsequent Speed 25’s on the increase to the tune of 150% in the last five years**, Speed 20’s may soon see a similar surge in interest, but for the time being, offers in the region of £76,000 - £85,000 may prove just the ticket for this highly desirable car with a glittering history.